Do you want to be able to cook healthier and tastier meals? Do you want to cut down on the time you spend in the kitchen? You can do it with the Big Air Fryer Cookbook! Cooking with an Air Fryer is a fantastic way to eat well and still produce outstanding food that your family and friends will love to eat. Using an Air Fryer is also quick, easy and convenient, so it’s a win all round. 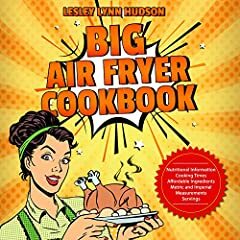 Including nutritional and energy values for of each recipe, easy to follow instructions, handy units of measurement in both the metric and American systems and measurement conversion, the Big Air Fryer Cookbook gives you everything you need. Now every mealtime will be special, whether it’s a midweek family supper or a sumptuous weekend meal with friends. Get your copy of the Big Air Fryer Cookbook now and cook better, tastier and faster meals for yourself and your family! Get the Kindle version for FREE when you purchase the paperback!